Inside: Make your own string art sign to add to your modern fall decor! I still love string art. From the first time I ever saw it on Pinterest, I knew I had to come up with a way to create some string art for my own home because it fits my sorta modern style perfectly. What surprised me is how easy it was to do. Believe me it looks way more complicated than it really is. 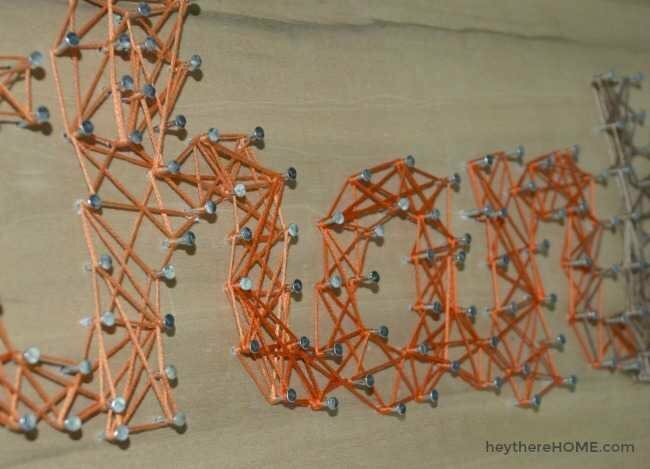 In this string art tutorial I’ll show you how to make string art words that blend from one color to another. The possibilities for this idea are endless. Fall decor is a bit difficult for me because most of it doesn’t naturally fit my style very well. 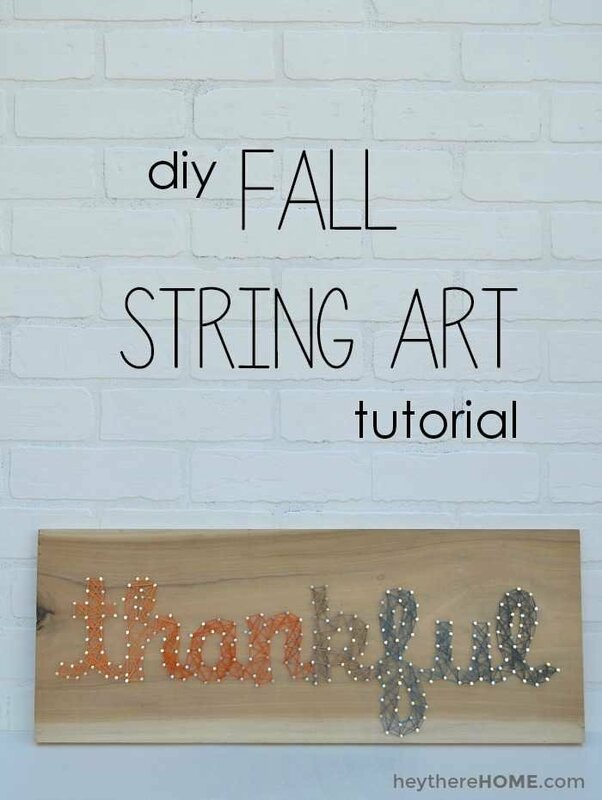 This “thankful” string art sign is the perfect addition to my fall decor that I like to keep simple and on the modern side. I love how it turned out. and wire and hooks if you plan to hang it. I bought an alder board that was so pretty so I didn’t even stain or paint it. I like how it adds a natural element to the otherwise modern design. To make the template I simply typed the word “thankful” onto a word document and set it to landscape. Then I played around with the font and the size until I got it to fit the board nicely. You will want to use a font that is thick like this font. It is called Clementine Sketch and I downloaded it for free on DaFont.com. Once I had it the right size I cut around it and taped it to my board. It will print on multiple pages, so just be sure to line up the lines. Then, I spent some time with my hammer nailing each nail about 1/2 way in along the outline of my word about every 1/2 inch making sure to put one at each point/corner. I usually get projects done while my kids are sleeping. Not this one though. It’s loud! When you are done with the nails, rip the paper off. If you have little bits left over, you can get them with your fingernail or tweezers. 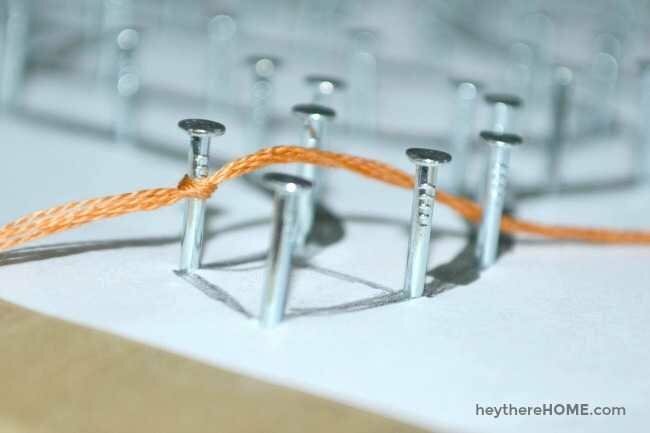 To start, tie one end of your string around a nail on your first letter (but take the paper off first…like I didn’t do and had to start over again…ugh.) You can cut off any extra and then start winding away back and forth and in all different directions going completely around a nail every so often to keep it tight. The more layers of string, the more solid the letter will look in the end. I had to stop every so often and push the string down the nails a little bit. To fade to a new color, do a lighter amount of the current color and then tie it off like you did when you started. Then start a new color on top of your first color and add some passes back and forth before you move into an area you haven’t covered yet. **I had to really pay attention to where my letters were because it was hard to tell with the cursive writing. My best advice is to stop every so often and make sure you haven’t gone across the middle of a letter where there shouldn’t be any string. This added a perfect modern fall accent to my living room in a way that fit in with my existing decor. I’m loving the blue and orange that I’ve been using this year. Hi there!! Love this sting art! What are the measurements of the piece of wood in length and height? Hey Jennifer, I used 3.5″ x 24″! Love this tutorial! Thank you for the step by step instructions – very helpful. I am wondering how large are the nails that you used for this project and how far up did they stick outside of the board. It looks like you managed to get them all the same height.. how did you manage to do this? I used about 1 inch nails with a 3/4 inch thick board. I tapped the nails in about half way. It’s best to practice on a scrap first and make sure you don’t use a wood that’s too hard or your nails will go crooked. Start with one at the height you want then just do small taps to get each additional one to the same height. It looks harder than it is, there really isn’t a trick to it beyond that. I like this. I have lots of weathered wood because my husband found a pile of pallets that the owner said he could take. Eureka! Another idea that is very popular on blogs, etc, is painting and decorating pumkins to match your decor. The sky is the limit! This is such good idea. I loved it… And I have included this post in my ’15 Awesome Gratitude filled Thanksgiving Ideas’ blog post. Do come over and check it out! Wondering what font was used. love it!! Hi Bre. It’s called Clementine Sketch. The link to where I downloaded it (for free) is in the post in the paragraph under what you will need. Have a great day! This is so cute, Corey! I love that you took pictures of each step–that really helps me see exactly how it’s done. Sorry you had so many problems with your host–it looks like things are up and running again! Thanks so much for sharing this at Frugal Crafty Home Blog Hop! I love this sign Corey! That is why I am featuring it today at the Get Your DIY On Challenge!! Come by to grab your button and bring a tablescape project if you have one to share!! I love how your string art turned out. Beautiful color choices and design! Thanks so much for linking up to The DIY’ers! I love your string art! You’ll enjoy using this each year. It also will be fun to make different versions for each holiday. This is beautiful! I recently tried a variation of string art and failed miserably, but you’ve inspired me to try again using the proper materials. Great job! 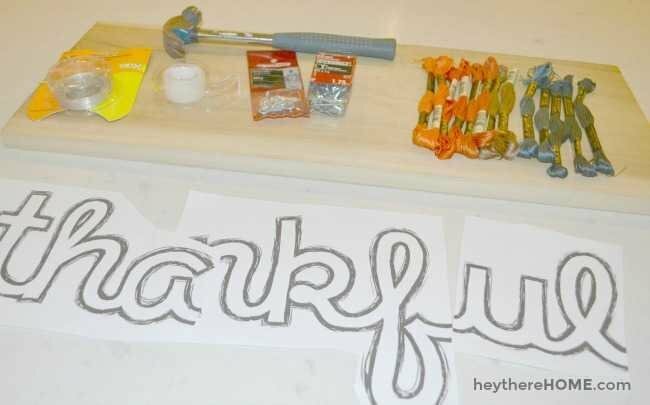 I am amazed by your Thankful string art, Corey! I think it’s awesome and would be great to keep up all year round! Great project Corey! I’ve wanted to try string art on awhile now, but the way you faded the colors together is definitely an awesome new twist! It actually wasn’t that bad. I did it during some TV time, which was a nice little break for me. I don’t usually watch much TV. As always, thanks for stopping by Krista! I have always loved string art, but wow…I REALLY love how you did the colour fade thing! So incredibly genius! Thanks Nicole! I sorta wish I’d have left out the brown, but I think it is nice for Fall. Thanks for stopping by! I love this string art project SO much! String art has been on my to-do-list for months now, just waiting for the right moment to try it out. I’d love to create something for my son’s room our our playroom. It was on my list forever too and I’m so glad I did one. Now I’m thinking of doing something bigger that I can have up year round! Thanks so much Tanya. This was on my art “to-try” list forever! So glad I get to check it off and enjoy it each year! Super cute, Corey!! I love that you used several colors – so pretty!